PopovBass wins Wilkinson Award for Residential Architecture (New) at NSW Australian Institute of Architects for Griffith House. 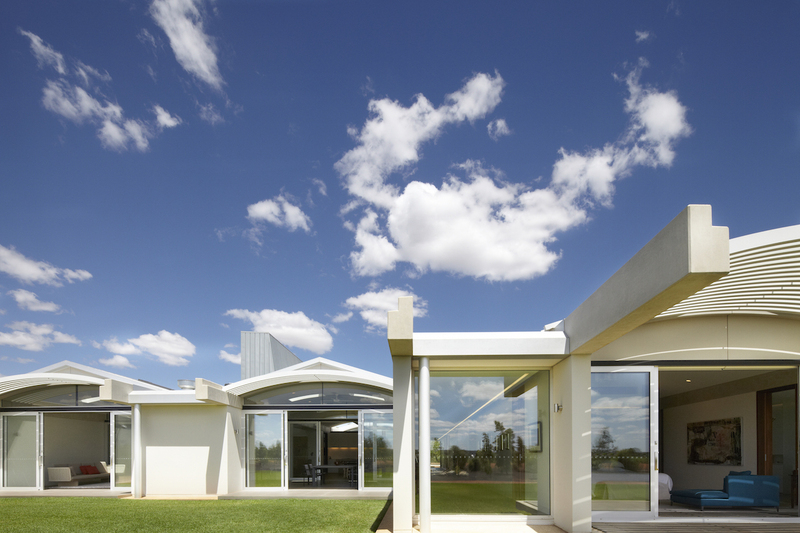 “On an unremarkable site in the flat plains of Griffith sits this courtyard house that fits remarkably well with its context. The planning for the house is calm and rational; the overriding sense within the house is of tranquillity. These is a delightful sequence of spaces as you progress through the house. The use of light throughout is masterful, and this is even more greatly appreciated when the house as “art gallery” is recognised. These is an intimate relationship to the artwork throughout, producing a further sense of wellbeing in the internal environment. Courtyard spaces provide direct and indirect light, and tall light scoops allow diffuse light deeper into the house. The brilliant light in this region has been handled with great sensitivity and the light levels throughout the project are complimentary to the artwork as well as providing a pleasant atmosphere. Thermally the house works exceptionally well with all the primary spaces facing north and thermal mass achieved through the concrete and masonry structure. Solar panels provide hydronic heating and photovoltaic cells provide a supplement to the electricity. 350,000 litres of water is stored on site.